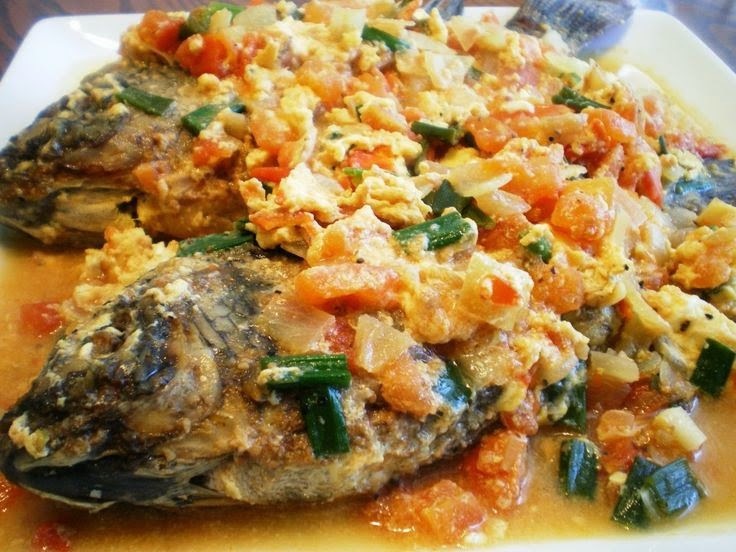 In the Philippines, it is a way to re-cook left-over fried fish. Often times it confused with Sarciado, this has beaten eggs added to sauteed tomatoes. The garlic, onion and tomatoes will produce a fragrant smell and it also enhances the flavor of the fish. This is definitely tasty and easy to cook. 1. Cut the fish into strips. Rub a little salt over the fish to coat. 2. Heat 1 tablespoon of the lard in a wok or large heavy-based frying pan over medium heat. 3. Add the fish and stir-fry, in batches, until golden brown. Remove to a plate once cooked. 4. Heat the remaining lard over low heat. Add the garlic and cook until golden, then add the onion and tomato and season with salt, to taste. 5. Cook until the tomato is soft and pulpy, then add 125 ml (4 fl oz/½ cup) water and simmer for 3–5 minutes. 6. Return the fish to the wok, then remove from the heat and add the egg, stirring to combine and heat through until the egg is set. Serve hot.